Innovative technology for precise and reliable measurement eXacto® – the compact and intelligent solution for non-destructive coating thickness measurement! 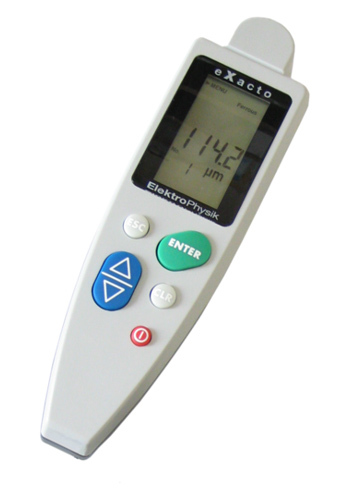 Suitable for measuring all non-magnetic coat- ings such as paint, chrome etc. on steel and all insulating coatings on non ferrous metals such as paint on Aluminium, anodising etc. Apart from high accuracy and ergonomic design, eXacto® features an intelli- gent probe to identify the substrate metal (ferrous or non ferrous) and automatically adjusts to the correct measuring principle.